A Pressure Gravity system® is ideal for buildings with a lower ceiling height and/or less heat emanating from the process. It utilizes a natural ventilator for exhaust, but powered sidewall fans to push cool air into the building at a greater rate. Think of it as a natural ventilation system with an extra boost from powered supply fans. A Pressure system has the same operating costs as an exhaust fan system, but the maintenance costs are much lower because the fans are handling clean air and they are more easily accessible. It is the natural solution for buildings in which natural ventilation isn't enough. When designing a ventilation system, our fist choice is always natural ventilation. Our second choice however, is Pressure Gravity ventilation. A Pressure Gravity system® utilizes natural ventilation principles, but has an extra boost that makes it fit in less than ideal environments. Intake fans can also push supply air deep into the plant’s interior, and improve conditions of the more heavily used spaces. This allows for a more comfortable environment where the plant personnel is working. 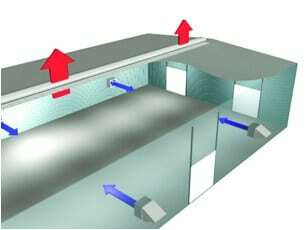 Pressure Gravity systems use non-powered, natural ventilators (Labyrinth or Thermoflow) along with powered supply equipment like a (PressureStream fan) to increase air-flow in a building, and make it cooler and more comfortable. Unlike a roof exhaust fan system that requires time-consuming, costly, and tedious roof modifications and maintenance hours each time more air is needed, a Pressure Gravity System® provides the ability to easily increase air-flow capacity.